The poster, trailer, and TV spot have been released. Discovery of Witches is the first installment of Deborah Harkness' All Souls Trilogy, which has sold more than 3.5 million copies worldwide. Originally published in 2011, tells the story of Diana, a young scholar at Oxford who is a descendant of the Salem witches. When she accidentally unlocks an enchanted manuscript, she is compelled to embrace the magic in her blood and enters a forbidden romance with charming 1,500-year-old vampire Matthew. The second novel, Shadow of Night, was published in 2012 followed by The Book of Life in 2014. Downton Abbey and The Good Wife star Matthew Goode stars as vampire Matthew Clairmont, while Hacksaw Ridge‘s Teresa Palmer plays heroine Diana Bishop in the series, which is produced by Jane Tranter and Julie Gardner’s Bad Wolf. It will air on Sky later this year. Kate Brooke (Mr Selfridge) penned the adaptation and is showrunner. Tranter, Gardner and Harkness are executive producers. I'll have to catch this if it ever shows up on Netflix at some point. Sky is doubling down on A Discovery of Witches – hanging the supernatural drama a bumper two season order. The British pay-TV giant has ordered seasons two and three of the Bad Wolf-produced series after the first season become the biggest drama on Sky One this year. Downton Abbey and The Good Wife star Goode stars as vampire Matthew Clairmont, while Hacksaw Ridge‘s Teresa Palmer plays heroine Diana Bishop in the series. Kate Brooke (Mr Selfridge) penned the first season adaptation and was showrunner. Season two will be written by Sarah Dollard (Doctor Who, Being Human) and Susie Conklin (The Musketeers, Cranford), who will also serve as an Executive Producer alongside co-founders of Bad Wolf, Jane Tranter and Julie Gardner, and Lachlan MacKinnon along with Deborah Harkness. In the second season, Goode and Palmer return, this time hiding in time in the treacherous world of Elizabethan London, where they must find a powerful witch teacher to help Diana control her magic and search for the elusive Book of Life. Season two will also see the return of Owen Teale (Game of Thrones), Alex Kingston (Doctor Who), Lindsay Duncan (The Honourable Woman), Valarie Pettiford (Half & Half), Edward Bluemel (The Commuter), Aiysha Hart (Line of Duty), Trevor Eve (Waking the Dead), Malin Buska (The Girl King) and Gregg Chillin (Being Human). 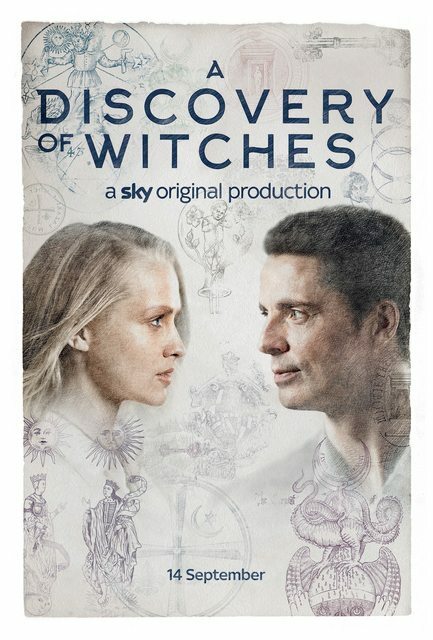 A Discovery of Witches was commissioned for Sky One by Sky’s head of drama Anne Mensah. The series is co-funded and distributed internationally by Sky Vision. It has also been sold in 84 territories including to AMC Networks SVODservices Shudder and Sundance Now, as well as SundanceTV in the U.S.